One in four drink too much, official figures show. Ten million people in England—one in four adults—are putting their health at risk by drinking too much, official figures have shown. 'Too much' is more than 21 units a week for men and 14 units for women. The highly questionable nature of these 'daily limits' has been discussed by my gracious host before; he has also recently touched on the changing way in which these units are counted, all of which reinforce the myth that there is a mounting epidemic of binge-drinking. 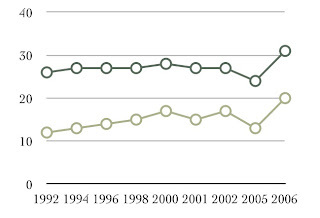 Since 2007, the Office of National Statistics has assumed larger glasses are being used and stronger alcohol is being consumed. They now assume that a glass of wine contains 2 units, rather than 1, as it did before. With beer, what used be counted as 1 unit is now counted as 1.5, what used to be 1.5 units is now assumed to be 2 units and what used to be 2.3 units (a large can) is now counted as 3 units. Nothing to see here, is there? 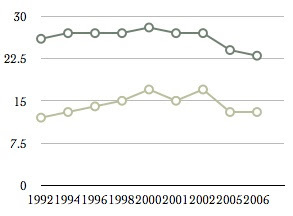 A downward trend since 2000 is evident for both sexes. Wa-hay! Booze Britain! 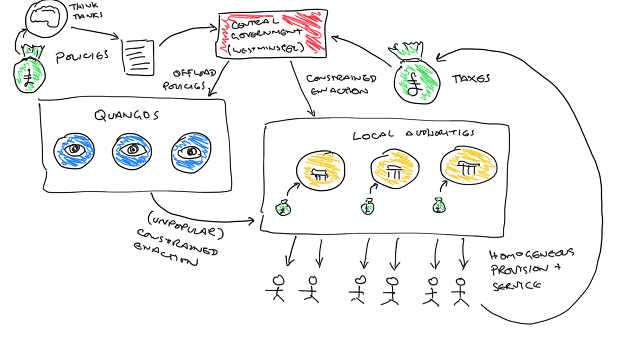 Exactly the same data but very different results. So which is the correct estimate? The ONS is, in my view, a basically honest institution and it seems fair to estimate 2 units are in the average glass of wine. It is less fair to assume stronger beer at a time when two of the biggest selling lagers—Stella and Becks—have introduced weaker brands. But wherever the truth may lie, the fact remains that even if the ONS had changed its system 10 years ago, the overall trend would remain downwards. This data is significant because per capita consumption effectively measures the amount of ethanol consumed by a person, which is what the system of units is supposed to do. But while units have to be clumsily estimated, the per capita system measures what has actually been bought and therefore, one has to assume, been drunk. According to the Institute of Alcohol Studies—no friends of the booze—total alcohol sales have fallen by 13% since 2001/02**. According to the ONS, the number of teetotallers has risen from 9.5% to 14% since 1992. And pubs are closing at the rate of 53 a week. And per capita consumption of pure alcohol currently stands at 11.2 litres, much less than Luxembourg (15.6 litres) and, indeed, less than 14 other European countries. That's your ‘Booze Britain’ for you. In his report, Sir Liam noted that over the preceding 20 years, the country’s disposable income had risen faster than alcohol taxation, and alcohol had become ever more affordable. It is true that alcohol has become more affordable. Everything has become more affordable as a result of rising prosperity. Most people would consider this to be a good thing. But relative to other products alcohol has become less affordable. When inflation is factored in, British households' disposable income increased from 100 to 208.8 between 1980 and 2008. In other words, people can afford to buy more than twice as much as they could in 1980. In the same period the affordability of alcohol—thanks to above-inflation tax rises—has only risen from 100 to 175. To imply that alcohol is actually "cheaper" is disingenuous in the extreme. Between 1980 and 2008, the price of alcohol increased by 283.3%. After considering inflation (at 21.3%), alcohol prices increased by 19.3% over the period. In real terms, as well as in monetary terms, alcohol is more expensive that it was 20 years ago. Britain needs to wake up to the epidemic of binge-drinking among teenagers and the misery it is causing thousands of families, one of the country's most senior policemen has warned. He criticised the drinks industry for targeting the young and exporting its "negative costs on to the streets, hospitals and into the criminal justice system". A survey of 13,000 young people by the Trading Standards Institute found the number of teenagers who drank weekly fell from 50% in 2005 to 38% this year. Fewer teenagers are drinking regularly—partly because it is becoming harder for youngsters to get hold of alcohol, a Trading Standards survey suggests. One in five pupils (20%) [11-15 years] had drunk alcohol in the last seven days, a proportion which has declined from 26% in 2001. The proportion of pupils who have never drunk alcohol has risen since 2003, from 39% to 46% in 2007. Trading Standards North West, which carried out the poll, said it intended to write to the firms behind these drinks to "seek clarification of the plans for action to reduce their appeal to young people". That's right. It's "the firms". Not the police, not the parents, not the shopkeepers and not—heaven forfend—Trading Standards. It's down to the manufacturers to stop people buying their products illegally. The number of people admitted to hospital in England with alcohol-related problems has risen by 69 per cent in five years, to 863,000 in 2007-08, although changes to data collection—which now include secondary diagnoses, such as alcohol-related injuries—have contributed to the surge in cases. Overall, the number of alcohol-related admissions increased with age in 2007/08, rising from 49,300 admissions among 16 to 24 year olds to 195,300 admissions of people aged 75 and over. Alcohol-related admissions to hospitals in England have soared by more than 50 per cent over the last five years, latest figures revealed last night. Startling data from the Department of Health showed there were 863,257 drink-related admissions in 2007-08, up sharply from 569,418 in 2003-04—the year Labour's reforms ushered in round-the-clock drinking. Supermarkets are selling beer at a cheaper price than water, fuelling concern over their role in Britain's binge-drinking crisis. 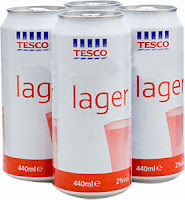 Despite repeated public health warnings, Tesco, Sainsbury's and Asda now offer lager at just 22p a can—less per litre than their own brand-mineral water and cola, and cheap enough to allow someone to get drunk for just £1. Eagle-eyed readers will have spotted something about the own-brand lager—it is piss-weak (2% ABV). Frankly, you might as well drink the water. 4 cans of this stuff equates to about a can and a half of Stella. Hardly enough to get "drunk for £1", although that didn't stop the Mail from printing a hilarious account of someone pretending to do just that. Away from media hysteria and the medical lobby's hyperbole, the facts are plain: we are drinking less than we did 100 years ago, more than we did 50 years ago and less than we did 5 years ago. We are middle-weights in the European drinking league and the fact that we have a lot of knob-heads causing problems in our towns and cities at the weekend is because there a lot of knob-heads in the UK. The reasons for that is a whole other story, but it has nothing to do with advertising, happy hours or the price of lager. It is doubtful that even the British Medical Association really believes that charging 50p a unit or banning Guiness adverts will make the slightest difference to rates of consumption, but that is not really the objective. The objective is to officially identify drinking as 'bad' in the same way that smoking is 'bad'. From that starting point, all else follows. With the rising cost of geriatric care they should actively be encouraging drinking, smoking, drug taking and dangerous sports. I'd agree with you that the key point is that they are identifying drinking as 'bad' - I give it until 2030 before beer, wine, etc is where having a fag is now. A well thought out post FS. The fake charities and the dishonest lobbyists are having a field day with drinkers, smokers and our foodstuffs puritanically upping their game. I piss on the lot of them. What a great article. I'll drink to that! I've Facebooked and Twattered this page Lisa, it it helps. Excellent posting.But I would just like to point out that if I choose to drink myself to death, it's nobodys business but mine.So to all you new puritans out there...get fucked. We will soon reach the same position as agw,so in light of this,as it could be a niche market,i propose alchohol credits,as a tee totaler,i can sell you a whole years supply,justthink ,you can get twice as pissed as you used to,without all of these moaning quacks telling you how awful the state of your liver is,how about 50p a unit,rising to 75p during the Christmas period.Also like the brewers,i can not be held accountable for the ocean of puke in the streets at closing time,all i have to do is wait until the sheeple have been terrified sufficiently,and make a killing.